Remember that loud roar by your friends when you hit three strikes in a row? The night they couldn’t stop laughing because the ball swerved off the lane? Bowling offers unlimited fun, it sure does! But, if you own the wrong bowling ball it might get frustrating at time. If you are in search of your perfect match, then you’ve come to the right place. Brunswick is one of the most popular bowling ball producers and they have created excellent balls that will take your game to a great new height. The Rhino is an excellent creation by Brunswick and this bad boy will help you burn the alley this season. Let’s have an in-depth look at the things that the Rhino has to offer. The Brunswick Rhino bowling ball is your guy if you’ve been playing bowling for some time and want to step up the game. 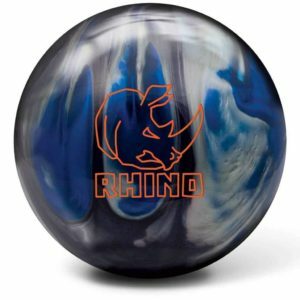 The Rhino ball is the newest addition to the Brunswick family and it’s a great choice if you want to have a bit more advanced play. The first notable feature of the Rhino is its symmetrical light bulb core that generates excellent pin action by enhancing the movement of the ball. If you didn’t know, symmetrical light bulb cores are the middle ground between the simpler pancake and the more complex asymmetrical cores. Namely, this concerns the hook potential of this ball. The symmetrical ball core would allow you to perform more advanced hits than with a pancake core, but it doesn’t require as much skill as an asymmetrical core would. Such kind of a core could be arguably mastered by beginners, but the reactive coverstock in the Rhino ball says otherwise. The reactive coverstock of the Brunswick Rhino bowling ball is the thing that makes it not really suitable for beginners. Brunswick markets this ball as an entry-level ball, but we don’t quite agree with them. Reactive coverstocks have the greatest hook potential among all coverstock types, which makes them excellent for hitting complex spares. However, reactive coverstocks can be different – the Brunswick Rhino’s coverstock has a more moderate hook to it, which makes it more manageable for the less experienced players. As for beginners, the hook potential, no matter how moderate, is most likely going to distract them from mastering the basics of bowling, which is why we think this ball isn’t the best for entry-level players. The Brunswick Rhino bowling ball has a max RG of 2.554 and a medium RG differential of 0.030, that is, the difference between its maximum and minimum RGs is moderate. On one hand, this decreases the ball’s hook potential, but on the other, it makes the ball’s path easier to predict and control. Again, not so experienced bowling players would likely appreciate the more controllable character of the Rhino ball. A big role in bowling balls is played by their design. This matters to some people, while others don’t care at all how their bowling ball looks. If you belong to the former, then you’ll be glad to hear that Brunswick offers 5 color options for this ball. The cherry on top is that you don’t need to make a dent on your wallet to purchase this ball. All these goodness comes with a very moderate price tag. The Rhino bowling ball isn’t the cheapest on the market, but it definitely packs quality sufficient for moderately-experienced players. Question: Does this ball come pre-drilled? Answer: No, this ball needs to be drilled after the purchase. Answer: Yes, the Brunswick Rhino has quite a decent hooking potential. Get your ball drilled by a professional who will calculate the distances of the holes that fit your fingers and you are ready with a hook ball! Question: Does this ball work better on oily or dry lanes? Answer: This ball is basically designed for dry to medium oil lanes. But you also need to consider the rev rate and ball speed of a player. If you have a very slow ball speed then with some adjustments to the coverstock you can this ball work on heavy oil lanes as well. But there are other balls which are more fit to do this job. Bowling balls are an inevitable part of the game and a quality bowling ball will work like a magic spell on your overall performance. Not all bowling ball has the same performance level so we recommend you to get the one that suits your playing style and all the other requirements. We’ve mentioned above that we don’t quite agree with Brunswick’s marketing of the Rhino ball. This isn’t the most difficult bowling ball out there to play with, but it isn’t the best option for a complete newbie either. It’s hooking potential, albeit not the highest out there, will most likely confuse beginners. If you are completely new to bowling, we’d advise you to go for a simpler ball with a plastic coverstock and a pancake core. Such a ball has the lowest hook potential out there, which would allow you to focus on your technique rather than on figuring out how to control the hooking motion. But if you’ve had some experience with bowling and want to step up your game, the Brunswick Rhino bowling ball is a great bang for the buck.